The MSI N280GTX OC Hydrogen certainly validated its high price tag. Taking into consideration the cost of the lush full cover copper block and the fact that this is an extremely high, pre-overclocked package and it starts to work out at a competitive price point. Alternatively, for £360 you could get a 4870x2 which would no doubt outperform even this pre-overclocked card in most areas, but at a cost. One of the benefits of having a water-cooled GPU that seems to come lower down the list of priorities to performance and cooling is something that is often overlooked. Depending on your water-cooling setup, the GTX280 OC HydroGen will run silent. A silent, high performing card is certainly nothing to be taken lightly these days, nor is the fact that many manufacturers will frown upon adding aftermarket cooling let alone water-cooling if it came to warranty issues. Herein lies the attraction of the MSI card. You get the best of both worlds - high Performance, silence, and cool running but no warranty worries. The pre-overclocks were already the fastest we have seen at OC3D so I was amazed at how much further the card could be pushed. A GPU core speed of a smidge under 800mhz is an amazing achievement, due in part to the efficient water-cooling block provided which kept temperatures in the mid 40's regardless of how much strain the card was under. The power draw of the card will be slightly less than that of a standard GTX due to there being no fan but consideration needs to be made to the added power requirements of a water-cooling loop. Noise, as we have previously mentioned isn't an issue so I am struggling to find anything bad to say about the card. If I had to find fault it would be the price. For the money you could buy the newer GTX285 and add your own block but this could invalidate your warranty - something a lot of people are concerned with doing after paying over £300. There is also the risk of damaging the card yourself when fitting an aftermarket waterblock but at this end of the market, speed is everything and speed usually goes hand-in-hand with temperatures so this is something people are willing to risk. The MSI card eradicates this risk. 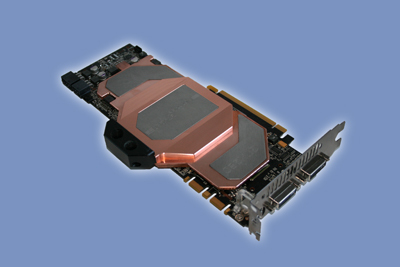 As stated, the flagship ATI card would offer more performance but then noise becomes an issue, so while the GTX280 OC HydroGen does at first glance appear expensive, it strikes a very even balance and could form an attractive proposition to the shrewd water-cooling performance junkie. Thanks to MSI for providing the n280GTX OC HydroGen for todays for review. Discuss in our forums.